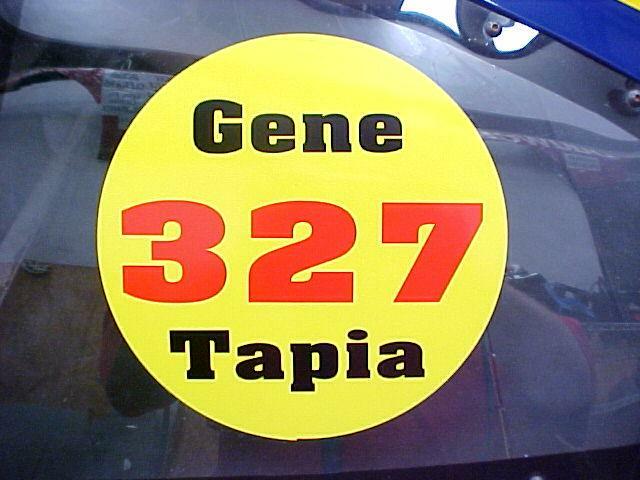 For the remainder of the 2005 season our ALLTEL Pontiac will carry the Tapia tribute sticker below. The Mobile Press Register article attached was written by Tapia's biographer, Gerald Hodges. We'll miss you Gene, thanks. Eugene H. Tapia, better known to Southern racing fans as Gene Tapia, died Tuesday at a Mobile area hospital. He was 80. Fans remember Tapia as the congenial driver of supermodified No. 327, and they dubbed him the "King of the Supermodifieds." A chance encounter with automobile racing at the old Lakeview Speedway on Lott Road in 1947 forged a connection that gave Tapia's competi tive spirit an outlet and led to the Alabama Hall of Fame for Auto Racing Pioneers. In his first NASCAR race in 1948, he went up against the sport's biggest stars of the time, including Buck Baker and Lee Petty. Tapia won one NASCAR championship but then left the circuit, saying he wanted to race more than once a week. He often competed up to five times a week at different tracks. Many short-track drivers, including Red Farmer, Donnie and Bobby Allison, and superstar Marty Robbins, emulated his style of racing. "Tapia was right up there with the best," Donnie Allison said Tuesday. "He could have made it real good in NASCAR, if he had chosen. But I think his regard for his family and the desire to race more frequently is what kept him closer to home." Tapia won both the 1968 and'69 World 300 held at Mobile International Speedway, billed as "the world's richest supermodified race." Drivers from as far away as California were on hand. When the checkered flag waved in 1969, Tapia was nine laps ahead of the second-place car. Ida Fields, the current owner of Mobile International, said Tapia was one of her late husband Lee's racing idols. "Before we bought the track in 1972, Richard Kennedy talked Lee into building a race car," she said. "When Lee would practice, he would follow the same line as Gene, and that's the way he learned to drive a race car. "Our racing community has lost another of its greats with the loss of Gene Tapia." Tapia's early life was just as dramatic as his racing career. At the age of 17, he wound up in Dutch Harbor, Alaska, as a civilian worker at a military base. Tapia was married at the time, but he left for Alaska after his involvement in a street fight in Crichton. The district attorney for Mobile County had advised him to get out of town if he didn't want to go to jail. While Tapia was gone, his wife, Francine, gave birth to their son, on Sept. 24, 1942, in Memphis, Tenn. But neither parent ever got to see their baby boy, Larry Eugene Tapia, because he was stolen from the hospital by a baby-theft ring that worked through the Tennessee Children's Home. In 1990, the Tapias finally got to meet their son, who grew up with the name Robert Adelson and lived in Missouri. The 47-year-old said he had been told that his birth parents were killed in a traffic accident. While on the job in Alaska, Tapia was wounded during an attack on Dutch Harbor by the Japanese. He returned to Mobile and joined the Marine Corps in June 1943. He finished boot camp, sniper training and then was assigned to the Third Marine Division as a Marine raider. Often, Tapia and a partner would swim three miles from a submarine in the Pacific Ocean to scout Japanese-held islands. After gathering information about the island and its defenses, the pair would have to swim back out and find the submarine. He served on Guadalcanal, the first-day invasion of Guam and spent 36 days on Iwo Jima, enduring some of the fiercest and bloodiest fighting of the war.